Stare up into the night sky and gaze at the vast number of constellations that greets the eye, then sign in to your mobile device and spin the reel on this wonderful 5 reel online slot game. Match up the starlit jewels of varying colours across the 10 paylines but what out for the shooting stars as this will indicate that you have won. NextGen Gaming was established in 1999 at the very birth of the online casino industry. Now with offices in London, Sydney and Stockholm NextGen are serving a worldwide marketplace with both their online and land-based gaming. With popular releases such as Love Doctor, Dolphin Reef and A Dragons Story NextGen have stood out from the crowd with their iconic graphic art and balance of enticing in-game features. From bonus games to one-of-a-kind additions the games under this developers’ name are forever pushing the boundaries of what a video slot can be. This impressive catalogue of award-winning software had rightfully landed this brand one of the top slot designers in the business. Gaze out into bejewelled skies and become an expert stargazer in NextGen Gaming’s Starmania. This intergalactic paradise is filled with the riches of the cosmos, riches that will be bestowed onto you when the stars align. These multi-coloured stars are just waiting to be discovered with each passing spin. Win these galaxy given gifts by matching the stars in at least 1 of the 10 available pay lines. Each star has a different rarity and in turn a different prize, the simple purple, blue and green stars can award the player with up to 50 coins whereas the bejewelled blue and green stars can award up to 75. The high prizes within Starmania can be found with the bejewelled purple star (awarding 100 coins) and the rarest of all, the red and yellow bejewelled stat (awarding the player up to 500 coins). As myth and legend depict the stars control all, including the possible bonus rounds within the game. Wild Symbols can find themselves within the reels, taking the place of any none bonus symbols to heighten the chances of winning combinations in the players favour. 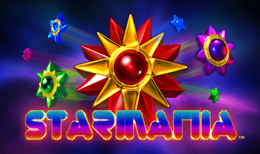 Starmania also holds a Bonus Symbol with 2x applied functions, it can multiply your total bet when appearing anywhere on the reels, 2x symbols will award 20x your total-bet, 4x symbols will result in 100x your total-bet and x5 symbols will lead to an amazing 200x your total bet. 3x bonus symbols found on the centre reels (2, 3 and 4) will also trigger 10x Free Games. If these massive multipliers don’t excite the player enough all winnings can also be gambled for the chance to double or even quadruple their perspective winnings. Once an amount has been won the player can choose to select the gamble button, this will then allow them to select either a colour between red and black or a card suit. If the card colour is guessed correctly all winnings from that round will be x2, if the suit is guessed correctly all winnings will be x4. If the player however guesses wrong all winnings from that round will fall to £0.00. Simplistic yet stunning this truly unique intergalactic journey is as easy to follow as it is on the eyes. With the option to gamble in multiple ways each winning round, players are able to personalise the game to their own range of comfort and risk – this ensures the game is suitable for novices and high-rollers alike.